Be the first to share your favorite memory, photo or story of Raul. This memorial page is dedicated for family, friends and future generations to celebrate the life of their loved one. 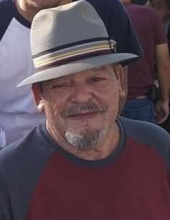 Raul M. Aguilera was entered into eternal rest on February 1, 2019 at the age 70. He was born September 24, 1948 in San Antonio, Texas. He was deeply loved and made a lasting impression on everyone he met. Known for his outspoken and humorous personality, Longfellow as known to many will deeply be missed. He is survived by his wife of 46 years Maria T. Aguilera, daughters Victoria Aguilera Garzes, Vangie Aguilera Morales and Vera Aguilera Morales, Sister Gloria Rodriguez and Brother Eddie Aguilera, seven Grandchildren and five Great Grandchildren. His strong will and instilled family values will continue to live on for generations to come. To send flowers or a remembrance gift to the family of Raul M Aguilera, please visit our Tribute Store. "Email Address" would like to share the life celebration of Raul M Aguilera. Click on the "link" to go to share a favorite memory or leave a condolence message for the family.